ZHUHAI, China—Trade tensions with China are already hurting some of America’s smaller aircraft makers, clouding their prospects at Tuesday’s biennial China airshow, normally a lucrative forum for clinching deals. China slapped a 5% levy on small and medium aircraft in September, leaving aerospace giant Boeing Company unscathed but affecting smaller players such as Robinson Helicopter Co. of Torrance, Calif.
Wilson Liao, chief executive of PTE Systems Ltd., a Chinese dealer of Robinson light helicopters, expects to sell just one or two of the manufacturer’s aircraft this year, down from about 20 normally amid trade tensions and China’s economic slowdown. The Trump administration’s tariffs on Chinese imports were partly spurred by a yawning trade imbalance between the world’s top two economies: the U.S. imported $505 billion in Chinese goods last year, whereas China bought $130 billion worth of American products. But in aerospace, the situation is flipped. China bought more than $16 billion worth of American aircraft and aerospace equipment in 2017, while its aerospace industry exported less than $1 billion in planes and parts to the U.S.
That gives China leverage it lacks in other sectors, potentially making aerospace “the designated hostage in this confrontation”, said Richard Aboulafia, a vice president at Teal Group, a U.S. aviation intelligence company. The question now is whether Boeing, the U.S.’s biggest exporter, will be the next to suffer. That hasn’t happened so far because China—where commercial air travel is growing rapidly—depends on both Boeing and Europe’s Airbus SE to supply jetliners to its expanding airlines. China accounts for a quarter of Boeing’s deliveries, and the company forecasts that about one in six of the 43,000 jetliners needed globally in the next 20 years will be sold in China. At Tuesday’s airshow, Boeing executives said the company’s operations remained unaffected by the trade dispute, as they outlined plans to invest more in China and expand the company’s local supply chain. “We continue to engage with the leaders of the U.S. and China to urge a constructive discussion to resolve these trade discrepancies,” said Rick Anderson, Boeing’s senior vice president for Northeast Asia. With consumer travel booming, China is expected to overtake the U.S. as the world’s biggest airline market in 2022. In a July interview, Boeing Chief Executive Dennis Muilenburg said the company wasn’t yet seeing any disruption resulting from trade tensions. “In China they need the airlift capacity,” he said. General aviation is also taking off: China licensed 93 new general aviation airports in the first half of 2018, having only had 80 in the whole country at the end of last year, according to the civil aviation authority. That’s a huge growth opportunity for U.S. producers of smaller aircraft, including Robinson and others such as Piper Aircraft Inc., Textron Inc.’s Cessna Aircraft Co. and Bell Helicopter Inc., General Dynamics Corp.’s Gulfstream Aerospace Co. and Lockheed Martin Corp.’s Sikorsky Aircraft Co. Furthermore, the U.S. and Chinese aerospace supply chains are deeply entwined. Boeing operates a joint venture in Tianjin, producing composite parts for jetliners, and a finishing center, which will install interiors for 737 Max jets destined for Chinese customers, is due to open next month near Shanghai. U.S. aerospace suppliers such as Honeywell International Inc. and Rockwell Collins Inc. also have sizable China operations and provide components for China’s emerging domestic jet industry. But the tariffs, combined with the weakening of the Chinese yuan currency, now threaten to choke off what had been a booming market for civil aircraft. Stratford, Conn-based Sikorsky normally gets about five to 10 helicopter orders a year, but that business has now dried up, said Li Xiaoyu, the company’s chief China representative. “The market’s changed; 2018 has been very quiet for us,” Mr. Li said. Sikorsky’s main Chinese customers, government ministries and state-run companies, “take politics into account when purchasing,” he said. Piper Aircraft Inc. scored the biggest order in its history—for 152 trainers—from Chinese dealer Fanmei Aviation Technologies in February, just before the U.S.-China trade tussle heated up. “We don’t want to get caught up in the politics,” said a spokeswoman for the Vero Beach, Fla-based firm, adding the company could probably sell the aircraft elsewhere should trade friction disrupt the order. A representative of Fanmei said it plans to honor the contract. The problem for these companies is that there are plenty of foreign alternatives should China hike aero tariffs to 25%—the level Beijing proposed in an early draft back in April. A representative of one non-U.S. producer of business jets, who asked not to be identified, said his company would get a big boost in China should tariffs price rival Gulfstream out of the market. A spokeswoman for Gulfstream—which secured the biggest order in its history from China four years ago—said the company wouldn’t publicly discuss the impact of tariffs. —Andrew Tangel, Chunying Zhang, Fanfan Wang and Doug Cameron contributed to this article. The US tariffs on Chinese goods are simply a negotiating position. They are already starting to have an effect on China's position. Those who are decrying the situation today should look at a little longer timeline. The situation as it has been for the last 20 years in not sustainable for the United States. Something had to be done, and at least President Trump is trying, not just kicking the can. I would like to know why past admins have allowed China to have their fingers in ownership and production of US companies anyway. That includes US debt. I know the answer. It was more profit. Chinese labor, is just that, woefully underpaid Chinese labor. Get out of China and employ US citizens, even if it costs more. "A representative of one non-U.S. producer of business jets, who asked not to be identified". Read Embraer. China is anxious to keep Boeing around for it's immediate fleet equipment, for av know how, for technology, and Boeing's IT. 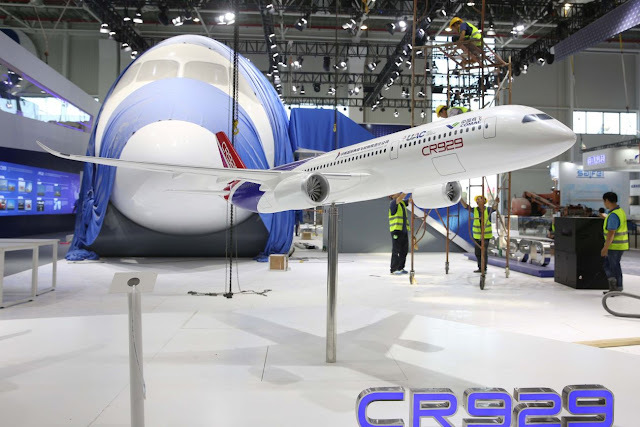 ... but when China starts rolling the cheaper 929's out the factory doors, it's pretty much curtains for Boeing!